Pennies really do add up. About a year ago we decided to start saving up our pennies. We started in a mason jar, then graduated to a butter bowl, then we moved to a sand bucket. It wasn't something that we were doing for a reason, other than my husband hates to have pennies "weighing his pockets down" and the coke machine doesn't take pennies. So we hid the bucket in the corner and whenever I cleaned his pile of pennies off the bathroom counter I threw them in the bucket. Not a major chore, it became a habit. So after about a year, the bucket was about to overflow. If you have ever had to roll a bucket of pennies, you would know it is a HUGE chore. My local Kroger has a Coinstar machine, so I figured that 9% was worth my time, especially with pennies. I toted my sand bucket to Kroger, dumped it all in, and walked out with $36. The little price I had to pay was less than $4, and it would have taken me HOURS to roll all those pennies. Coinstar soooooo works for me! For more Works for Me Wednesday tips, roll on over to see Shannon at Rocks in My Dryer. I love Coinstar! The next time you do it, see if your machine offers Gift Cards. If you put the money right onto a gift card (at a store you would normally shop anyway), it waives the counting fee. You got the actual amount of your coins and are all ready for your next shopping trip. The last time I did this, I got $151 to spend on Amazon! I do that with all my change, it's amazing how quicky it adds up! What a good idea! My 6 year old keeps begging me to take him to the bank to empty his piggy bank. I just haven't wanted to lug the baby in with us. I know that our grocery store has one and I will try it out next time I go! Interesting. I know our stores have them...I just figured it would be expensive to use them. So, the kids take their coins to their bank. I will check it out and see if it offers the gift card like your one commentor mentioned. My husband and I loved these machines where we used to live but they dont have one in our area now. So guess how gets to count the pennies. (hint: it's not my husband). 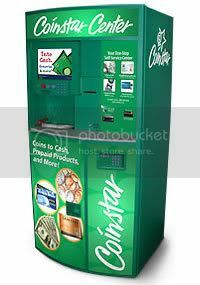 Great idea .. my Coinstar offers the gift card option and it IS so worth it! My credit union also has a machine that will count it for free as long as you have an account with them. May be another option for you to keep your 4 dollars, but I know what you mean. That is $36 you did not before. I am a HUGE fan of LikeMerchantships too! (We are on a forum together). I just read you were a fan through frugal hacks. My local bank will actually put your cash through their coin machine for free - whether you have an account or not. That eliminates the 9% fee. So now I save up and use that. Not sure where you live - it's Sovereign Bank, which I know has offices throughout PA, and I think further than that. Just another idea. The saving is the important part!